Last month, PJ and I spent three-and-a-half days in New York City for his birthday. 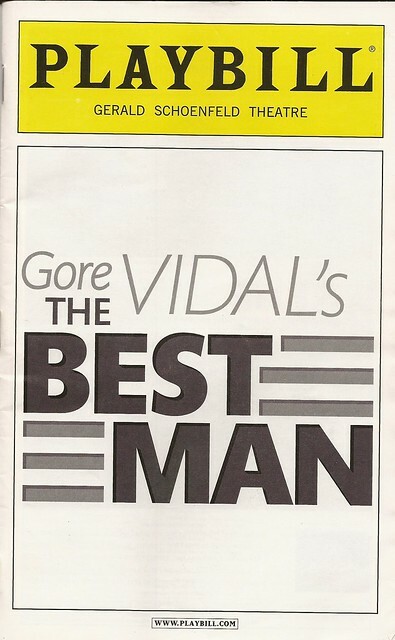 While there we saw three shows, the first of which was Gore Vidal’s The Best Man. I almost went to see this play when I was in the city in April, but decided to see End of the Rainbow instead. I’m glad I waited, since I think PJ enjoyed this one more than he would have enjoyed Rainbow. The appeal of the play, at least in part, was its all-star cast, which included James Earl Jones, Candice Bergen, Eric McCormack, John Larroquette, and Angela Lansbury. We couldn’t pass up a chance to see all of these actors together. The Best Man is a political drama. Set at a major party’s presidential nominating convention in Philadelphia in 1960, the play follows the two major candidates for the nomination: William Russell, played by Larroquette, and Joseph Cantwell, played by McCormack, and their wives and political consultants. Russell is the former Secretary of State and the more progressive of the two candidates. Cantwell is a conservative senator who is an up-and-comer in the party. When Cantwell threatens to reveal damaging information about Russell to the convention goers, Russell must decide how to respond: release even more damaging information about Cantwell or try to take the high road, even if it means losing the nomination. What stands out about this play is how timely it remains. Many of the issues it raises about politics are still true today. It asks whether winning is more important than remaining ethical and what are the consequences of playing dirty. It’s an interesting and insightful look into the political sphere. Larroquette and McCormack are both excellent in their respective roles. Somewhat surprisingly, it was Jones who received a Tony nomination for Best Actor for his role as the former president. His isn’t really a leading role, and Jones doesn’t do anything spectacular with it — he’s just solidly good. Candice Bergen is excellent as Russell’s wife, from whom he is estranged but who is playing the part of a good wife for appearances sake. Slowly, she becomes the moral center of the play, and PJ and I both thought Bergin stood out in a quiet, but emotionally moving sort of way. And finally, Lansbury plays a small, but key role as one of the leaders of the women’s caucus of the party convention. Fancying herself as a king-maker, she plays both sides of the contest, ready to assume an influential role with whoever wins the nomination. Overall, Gore Vidal’s The Best Man is an interesting look at politics that remains pertinent to today’s political gamesmanship. The final resolution is a bit predictable, and I thought the consequences for the Russells’ marriage was not really credible, but I liked it nevertheless. It’s been extended a couple of times, and I recommend it to anyone looking for a smart play about politics and its moral/ethical decline.